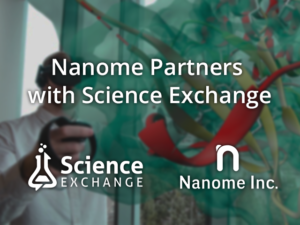 PALO ALTO, CA, January 18, 2018 – Science Exchange, the world’s leading and most secure enterprise platform for outsourced research and development (R&D) services, announced a partnership with Nanome Inc. to offer scientists on-demand access to Nanome’s blockchain and virtual reality technology. Nanome is a San Diego-based company whose mission is to democratize science through blockchain technology and virtual reality tools to aid in the progression of molecular precision and advancements in nanotechnology. Nanome primarily helps medicinal chemists and structural biologists understand complex molecular data through immersive and collaborative applications that facilitate faster pattern recognition, better molecular visualization, and a more efficient drug design and drug discovery process. The Matryx blockchain platform enables researchers to collaborate and share results while securing their intellectual property through the blockchain.